Woke up this morning to temps in the low 50s. Nice! I know you northern folks (and far southern hemisphere folks) don’t think the 50s (Fahrenheit) is cool, but we native Floridians sure do consider it a “nip in the air”. I can assure you. After sweltering through summer here, these kinds of temps are much welcomed. They provide pleasant relief to ourselves and our electric bills. Kinda’ makes you wonder how anyone ever lived in Florida BAC (before air conditioning). Most of the time, I’m wearing shorts, t-shirts, and flip-flops around. It’s a nice change to be able to wear long pants and a flannel shirt and maybe even shoes of some sort. Right now I’m sitting here in sweat pants, flannel shirt, and flip-flops. I’ll be wearing my furry fagot slippers, as my dad used to call them, when it’s a bit cooler. Can’t let the footsies get too cold, you know. 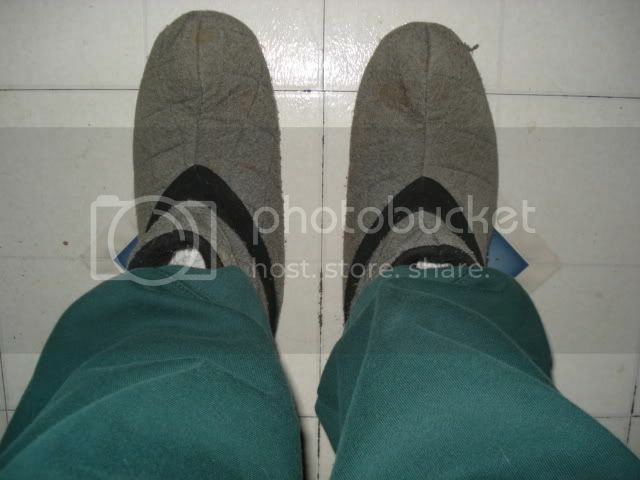 Posted by V. T. Eric Layton on 5 November 2010 in Whatnots and tagged AC, cool, flip-flops, Florida, weather. Yeah I remember those days in Florida. Heck when it got down in the 40s we used to wear longjohns and thick coats. Now I live in PA and everyone looks at me crazy when wear a thick coat in the 40s. I suspect you’d actually grow to love Urmas’ Helsinki winters after a while. They’d sure make you appreciate summer more! Well we had frost this morning for the first time. Not heavy mind you but enough to make the grass crunchy. I am eagerly awaiting winter for the first time in many years. My sweetie, who was born and raised on Vancouver Island, and two very dear friends who moved here in 2004 have told me to expect a very mild and practiaclly snowless winter. Well in the part of the Island we live in. Parksville. I can’t remember a winter without snow, lots of it. Northern Ontario first with winter from Nov. to Apr. and then SW Ont. from Dec/Jan to Mar. The closest we came was the two winter months “Juliette” and I spent on Sanibel Island. Those were magical. Anyways, here I can golf year round,I’m told you don’t shovel snow because it melts in 2-3 days and I don’t need a heavy parka or snowmobile boots. Having said all that, and as one of my Operating Room supervisors once said about me in a performance review, “Mr. C is from Missouri…he has to be shown everything etc. etc. Sorry for blabbing on Eric. I like this, I could get used to communicating with you on a regular basis.